The sweet and the sour make for a delicate, and intoxicating, balance, in Cuba's national cocktail. And so it is for much of the country. Keen to experience the socialist island before the impending (2nd) invasion by the yanquis, and prior to any changes that the eventual passing of the torch from the frail Castro brothers will bring, we decided to spend a few days in Cuba. Not in the all-inclusive resort ghettos of Varadero and Holguin, mind you, but in the nation's emblematic capital Havana, where we stayed at a privately run casa particular, in itself proof of the small steps towards liberalization that the government has taken in the past years. The experience in one of the last vestiges of communism was interesting, to say the least. 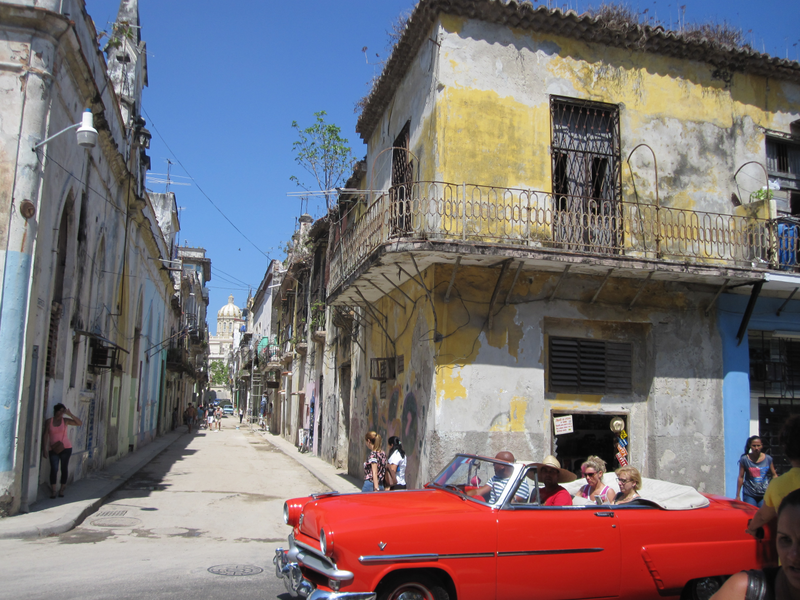 Havana is steeped in history, little of it reflecting favorably on mankind. From its beginnings as a Spanish colonial port, through direct and indirect US rule, the dictatorship of Fulgencio Batista to the 1959 revolution, the city's politics were seldom sober. It remains very much in limbo, a state symbolized by the grand capitolio, which may look like the one in Washington D.C., but unlike it is under renovation and closed to the public. Some streets and plazas have been beautifully renovated, but many others are still wilting away in the tropical heat. Yes, there are indeed plenty of vintage American cars from the fifties, including some very well kept ones. But while tourists pose with the Chevys and Buicks, the Cubans are thirsting for that '98 Peugeot breezing down the Malecón. In a country with two currencies in circulation, a convertible peso pegged to the greenback and a national peso (in which salaries are paid), we got our hands on some of the latter. For the past few years, it has been legal for foreigners to do so, much like Cubans can now officially own convertible money - if they can get a hold of it. The few things we were able to buy with moneda national, such as ice cream, snacks and cigarettes, were incredibly cheap. However, they were also often unavailable. The government-run stores, even in downtown Havana, were repeatedly out of the most basic goods such as bottled water. And while we were able to fall back on our hard currency to spend two Cuban monthly salaries on a seaside dinner, the locals can only comfort themselves with cheap rum, which was always in stock. The two undisputed achievements of the revolution are in health care and education. Cubans' life expectancy today is within a year of the 79.6 years enjoyed by the average American, with a per-capita expenditure that is a fraction of the Yankees'. And a comprehensive school system, rolled out nationwide, has produced a literacy rate unheard of in the Carribean. Indeed, we came across many basic, but functional schools attended by cheery kids in immaculate uniforms. The most essential life skill, however, is not taught in school but on the streets: Making due. We witnessed incredibly creative ways in which the locals jerry-rigged everything from water pumps to mobile phone chargers and kitchen appliances. With conspicuous consumption unconspicuously absent, Cubans' inventiveness would make McGyver proud. This unique society is bound to change, gradually in the best case and violently in the worst. Getting a first-hand impression of the island's reality today was very worthwhile, for what we saw was unlike the ideological fantasies peddled by aging European lefties or radical Republicans. Cuba under the Castros is its own special mix. And those who find that hard to swallow can always change their order. To a Cuba Libre!